Drake Commissary is just the latest tentacle to emerge from Jeff Stober’s Drake Hotel. Monday is the official launch of the newest outpost of the Drake Hotel empire, Drake Commissary. Located on Sterling Road in Toronto's Junction Triangle, the Commissary will serve as the centre of the Drake's food operations. The space has a chic living room vibe, and it blurs the lines between a restaurant, bar, bakery and food production facility for the Drake's budding catering and retail operations. It's just the latest tentacle to emerge from Jeff Stober's Drake Hotel. After the elegant, culture-focused hotel launched on Queen West in 2004, Stober went on to launch the Drake One Fifty restaurant in the financial district, five Drake General Stores and the Drake Devonshire Inn in Prince Edward County. The company now employs more than 500 people on its various properties. I sat down with Jeff Stober on the patio of the Drake Hotel recently to talk about the thinking behind the company's expansion. After you sold your first company, you decided to purchase the Drake Hotel. At the time the Queen Street West area wasn't considered a desirable part of town. What did you see that others didn't? When I sold my computer consulting firm, I had the idea of reimagining an old beat up hotel on the edge of downtown. A lot of people thought it was well beyond downtown but I saw it as part of downtown. The neighbourhood was already fully developed to my mind. Gorgeous streets – we're sitting out here on Beaconsfield now – beautiful artist loft buildings, all the artists and galleries were here. I was following in their footsteps…. In those days, that was my post corporate celebration. We didn't want to have a business plan. We didn't want to have a budget. We were just gonna use our gut to lead the way and that was a starting point and I would say thank God for that. The level of authenticity that comes from a heartfelt starting point as opposed to a business plan allowed us to build a deeply rooted Drake DNA from the get go. We are now guided by business plans and budgets but that never supersedes, overwhelms or distorts our deeper focus. Queen Street West has a very different feel from the other areas you've set up businesses in – the financial district and Prince Edward County. I always look at doing the unexpected, for sure. It speaks to the fact that we believe one of our prime missions with this company is the realization that there's a curious culture seeker in everyone. I don't care if you're working on Queen Street, in the Junction, Prince Edward County, on Bay Street. Fundamentally we're all creative people. What was the motivation behind launching the Commissary? The Commissary is in a historic neighbourhood. There is huge artistic pedigree in that neighbourhood. It's in a beautiful old manufacturing building with great bones. We looked at the physical positioning of that building, between the Railpath and UP Express. You can bike and walk. We saw it as this really cool hub. MOCA [Museum of Contemporary Art] is going in next door, which is fantastic, and a lot of our fabricator friends are right around there. The Drake is a community hub. That's what we do. In this instance, it's the notion of a culinary cultural hub where bakers and makers would interact directly with the customer face-to-face and people would see the means of production. We would make everything from scratch. We would bake, we would cure, we would smoke, we would ferment. It's really ambitious but it also serves a tremendous business purpose within our ecosystem, supplying all our restaurants and creating a destination unto itself at the Commissary. Each Drake property is unique, but they have a certain brand consistency. Do you consider it a chain? We don't see ourselves as a chain. We see ourselves as a collection of unique properties that are at once both integrated into the overall brand and at the same time highly unique and independent. You see that in our employee base. We're all highly unique individuals, many of whom come from arts and culture background. So at the end of the day the word chain is a just not the type of word that we would consider ourselves aligning with in the slightest. It's distasteful frankly. We see ourselves as a small collection of individual, deeply neighbourhood-focused and rooted establishments. Where is the Drake headed next? Are you considering expanding to the U.S.? No. We're staunchly, proudly Canadian. Everyone dreams of doing something in the States. There are fabulous American cities but at the end of the day, we've developed an amazing footprint in Canada. We're definitely looking at projects as we speak but suffice to say we see a tremendous opportunity for the evolution of our brand of Canadiana, our quirk, our appeal, our sense of nostalgia. We're very experiential as a company and we think that there's more than enough room to grow in Canada and that's what we plan on doing. 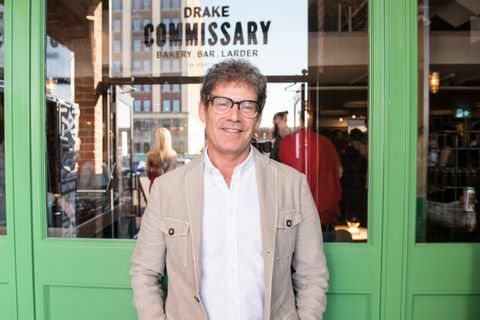 Take a 360-degree tour of the new Drake Commissary with corporate executive chef Ted Corrado. Camera and editing by Timothy Moore. Camera provided by Samsung Canada.